Archibald Alexander was born on July 18, 1823 to Charles and Sarah Bache Hodge in a frame house at the corner of Witherspoon and Main (Nassau Street) across from the Princeton College campus. He was named for Charles’s mentor, colleague, friend, and Princeton Seminary’s first professor, Archibald Alexander. A brick house was built by the Hodges on the seminary campus which was completed in 1825. Some extant student journals and diaries in the seminary archives mention seeing young Archie romping about the campus. The house was not only the family residence but also the place where Charles kept his study. As Archie grew up, he saw many students visit his father seeking help with lessons and counsel regarding their callings, family, and future studies. Archie was not a very studious boy or overly fond of books, but he did enjoy scientific studies. 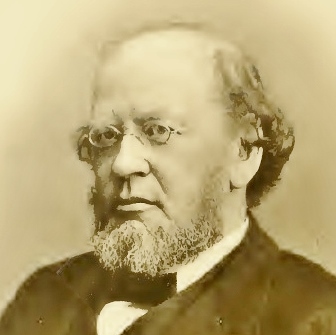 Archibald A. Hodge pursued his interest in science by studying physics with Professor Joseph Henry at Princeton College completing his program with the class of 1841. What an opportunity it had been for Archie. Henry was one of the preeminent scientists of his day. He had made advances in the study of inductance and the “Henry,” the unit of inductance, was named for him. When young Hodge completed his college program, he taught for a year in the Lawrenceville School before beginning his divinity program in the seminary in 1843. While he was studying in the seminary he earned some income tutoring in the college and also received the A. M. in 1844. He was one of a group of students that included B. T. Lacy, Samuel B. McPheeters, Phillips, and William M. Scott, who were especially interested in the study of Systematic Theology and wanted to put Dr. Hodge’s lectures on paper. They divided among themselves the work of writing down the lectures, which they compiled into cogent transcriptions after the lectures were over. 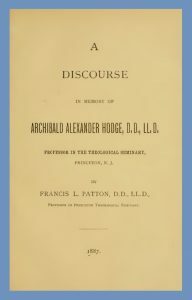 It was through his class studies and conversations with his father on theological subjects that Archibald Hodge laid the foundation for his own ministerial and teaching career, though no one would have prophesied—and least of all his father—that he would one day be a teacher of theology himself. As he continued his preparation for the ministry, A. A. Hodge offered himself to the Presbyterian Board of Foreign Missions, Old School, where he was accepted for missionary work in India. Following his licensure by the Presbytery of New Brunswick in 1846, he was ordained an evangelist for overseas foreign missions by the same presbytery in May 1847. After marrying Elizabeth Bent Holliday on June 18, the two sailed for their field of service half-way around the world in Allahabad, India. However, due to illnesses contracted on the field by both he and his wife, they and their two children returned to the United States in 1850. Even though his service had been only a few years, he had provided significant guidance to the mission at Allahabad by harmonizing disagreeing elements and providing a unifying force through his leadership and congeniality. But what was more important, his experience in the mission field enhanced his zeal for the mission cause, gave him a grasp of missionary problems, and began a life-long interest in overseas work that made him a trusted counsellor for all those among his pupils contemplating a missionary career. When the Hodges returned to the United States in 1851, they settled in Lower West Nottingham, Maryland. It was a rural charge and the salary—a little more than six hundred dollars a year—meant the purse strings must be kept tight, but Pastor Hodge appreciated the opportunity to preach and minister to his congregation. He then moved to Fredericksburg, Virginia, from which he moved back across the Mason-Dixon Line to shepherd the First Presbyterian Church, Wilkes Barre, Pennsylvania. His next call, in 1864, was to serve in the Presbyterian seminary in Allegheny, Pennsylvania, where his background of overseas mission work and thirteen years of pastoral experience enhanced his résumé for teaching theology to ministerial candidates. A. A. Hodge could not stay away from the pulpit during his Allegheny years. He supplied First Church, Pittsburgh, briefly, and then for his remaining Pittsburgh years he ministered to a congregation that grew under his preaching to become the North Church in Allegheny City. While in Allegheny, Elizabeth died and he married the widow, Margaret (McLaren) Woods. Margaret was the daughter of Rev. John Finlay McLaren. Charles Hodge was approaching his eightieth birthday when both he and Princeton Seminary realized he needed help with his teaching load. There could be no doubt respecting the man who was most conspicuously fit to be the associate and successor of Dr. Charles Hodge, it had to be the chip off the old block, A. A. Hodge. He was called to help his father but his work was short lived because Charles Hodge died, June 19, 1878, which meant that beginning with the fall term, Archie would become Professor of Didactic and Polemic Theology A. A. Hodge. From August 12, 1812, to November 18, 1877, for more than sixty-five years, there had been only two professors of Systematic Theology in Princeton, and Dr. A. A. Hodge would become the third by succeeding his father. On November 11, 1886, A. A. Hodge died after four days of suffering with what was diagnosed as uremia. He was survived by his wife, Margaret, and the two daughters, Sarah and Elizabeth, from his first marriage; Sarah was named for her father’s mother, and Elizabeth was named for her own mother. On November 15, Princeton was in mourning with its shops closed while the remains of Archibald Alexander Hodge, D.D., LL. D., were taken to the cemetery where he joined other faculty and their families that had gone before. He had been honored over the years with the Doctor of Divinity by Princeton College, 1882, and he had also been given the LL. D. by Wooster College in Ohio, 1876. He was on the seminary board from 1881-1886. 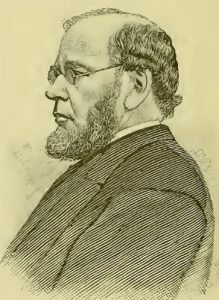 His writings were many, but his key books are Outlines of Theology, 1860; The Atonement, 1867; A Commentary on the Westminster Confessions of Faith, 1869; The Life of Charles Hodge, 1880; Popular Lectures on Theological Themes, 1887; and The System of Theology Contained in the Westminster Shorter Catechism Opened and Explained, 1888. Two of his journal articles are, “The Ordo Salutis” (Princeton Review, 1878), and “The Consensus of the Reformed Confessions” (The Presbyterian Review, 1884). He also published several theological tracts and pamphlets. Francis Landey Patton, who at the time of A. A. Hodge’s death was a colleague in the seminary, summed up his perspective on his departed friend as a theologian in his memorial discourse. Think then of Dr. A. A. Hodge as having an acute mind; interested in theological speculation; rethinking independently the old questions analytic in his mental processes; full of scholastic subtleties; bold, confident, intense in his convictions; filled with reverence for good traditions; holding the Reformed faith as a sacred trust, and also as a personal possession; pervaded by this faith and living on terms of easy familiarity with it; able to distinguish between essence and accident, and knowing when harmless idiosyncrasy runs into serious doctrinal divergence; strong in his convictions, but not litigious; tenacious of principle, but never sticking in the bark; a sturdy, robust thinker, always ready to defend the faith; a brilliant thinker, so that, as circumstances required, he could send truth out in the shining drapery of soft and beautiful speech, or shoot it forth like forked lightning, hot and scathing, to leave on the face of error the scarred record of its presence—think of him, I say, as exhibiting this many-sided mental expression, and you have my conception of the type of theologians to which Dr. Hodge belonged. Dr. A. A. Hodge’s successor was to be another scholar that had enjoyed science in his younger years and made his way back to Princeton via Allegheny, B. B. Warfield. Two publications by Dr. Hodge are available on Presbyterians of the Past in PDF for downloading. The article, “Religion in the Public Schools,” 1887, which was published in the Princeton Review. The brief pamphlet, Presbyterian Doctrine, Briefly Stated, 1869. Sources—the primary source is Francis L. Patton’s, A Discourse in Memory of Archibald Alexander Hodge, D.D., LL.D., Philadelphia: John Wanamaker, 1887, and the engraved portrait is its frontispiece; David Calhoun’s two volumes on Princeton Seminary; Princeton seminary’s Necrological Reports; and other standard Presbyterian and Princeton sources. 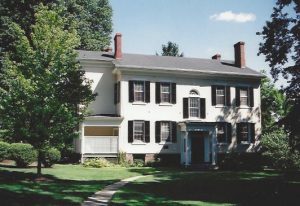 The photograph of the Hodge House on the seminary campus was taken by the author. The picture shows that a section has been added to the left side of the house because the chimney has been covered by the addition. In Charles Hodge’s day, students would enter via a door on the left side so as not to disturb the household by knocking on the front door. Notes—A. A. Hodge’s inaugural lecture at Princeton Seminary is available on the “This Day in Presbyterian History” website of the PCA Historical Center. Biographies of both Francis L. Patton and B. B. Warfield are available on this site. It was mentioned that a classmate of A. A. Hodge’s at Princeton was a man named “Phillips,” who was an associate with Hodge and others on the project to transcribe Charles Hodge’s lectures, but there were three men named Phillips in the seminary at the same time as A. A. Hodge, so his identity is not certain. There is some confusion among the sources regarding the date of A. A. Hodge’s death. Some sources say he died November 12, 1886, but he in fact died on the eleventh. I believe the error is attributable to the way F. L. Patton told of the death in his memorial, because he said, “A shock of personal bereavement was felt by every one and by all classes when word went out on the morning of the 12th November that Dr. A. A. Hodge was dead” (p. 23). The announcement was on the twelfth but he died the day before. His grave marker has the eleventh.